Plane the Trail Shoulder – Can it really be that Simple? 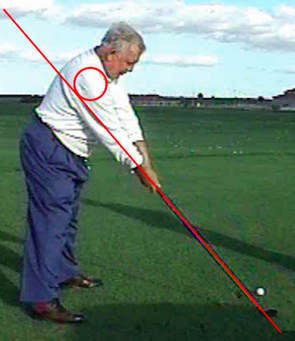 Moe’s body and arm position at address allowed for him to reduce numerous variables in the golf swing. When you can eliminate variables, you can become more consistent. In the picture above, you can see a red circle on his trail shoulder. The trail shoulder is positioned slightly above the red plane line. 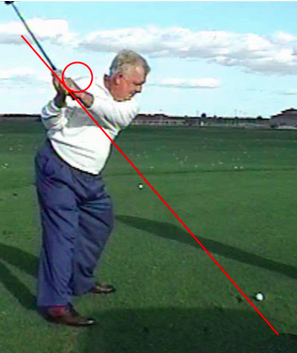 Once we establish this address position, it causes a smooth backswing and downswing…. The only difference between address and impact from this down-the-line perspective is the rotation of Moe’s hips and torso. 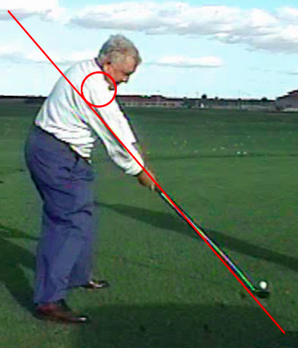 In this picture to the right, you can see how the hips and chest are rotated open. This has to occur for the hands to lead. Join Us – Let Us Help You Make It That Simple….